While the nature versus nurture debate rages on, Michael Alvarado has a love and affinity for technology that owes a fair amount to both. His father has always been early adopter of technology—the guy who is always first in line to buy the latest gadget. In middle school, Alvarado immersed himself in Bulletin Board Systems (BBSes). Many of Alvarado’s friends were also technologically inclined and gravitated to BBSes, soon discovering their knack for programming. A few started developing door games that were relatively successful. “I was just amazed that, at a young age, someone could create something that could have such positive impact on the world,” Alvarado says. Not mechanically gifted, Alvarado recognized that technology offered him an alternative means of creativity and creation. In 2006, Alvarado found the perfect place to pursue his interests when he started working for Jacobs Engineering, which provides professional and technical services to commercial, industrial, and government clients. After Alvarado had worked in many areas across Jacobs, a former client called him about an emerging project and encouraged him to pursue it. Looking back on it, Alvarado says the project itself probably didn’t make a lot of sense, but he bet the director of business development that they could win it. “I think that bit of audacity, combined with some encouraging words from my supervisor, led me to be offered a place on the business development team after an aggressive interview process,” Alvarado says. 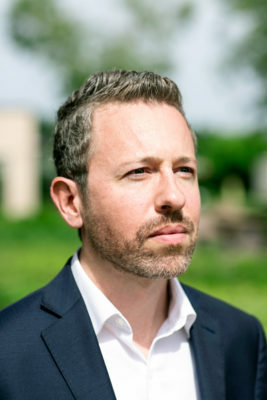 After six years of growing the business with a small, high-performance team, Alvarado’s boss and mentor assumed a new position, whereupon Alvarado was offered a new role, specifically focused on leading growth of the company’s portfolio of systems acquisition, logistics, and testing and training services. Quickly thereafter, he was asked to assume growth-strategy responsibilities for Jacobs’ burgeoning intelligence, IT, and cyber business. Alvarado recently added yet another role to his résumé: delivering growth-strategy integration and orchestration across Jacobs’ diverse set of markets, clients, and geographies within its aerospace, technology, environmental, and nuclear lines of business. A large part of Alvarado’s current role is focused helping clients through the digital transformation process, and he says it’s a surprisingly personal experience. Alvarado compares it to multigenerational families, wherein, for some members, just turning on the computer to access email is a challenge. For others, technology is an integral part of their lives: they use social media to get their news, online platforms to date, and mobile technology to control and monitor their homes. Data saturation is an imperative, and the need for active information security behaviors is known. For some clients, this might be as simple as moving from pen and paper to a basic digital document workflow. Others, however, are looking to use advanced analytics, visualization, and artificial intelligence. “Much of the challenge is cultural and focused on balancing the speed of transformation,” Alvarado says. Another challenge Alvarado has faced since rising within the ranks of Jacobs is defining his own leadership style. He ended up drawing on the examples of great leaders for whom he’s worked in the past.